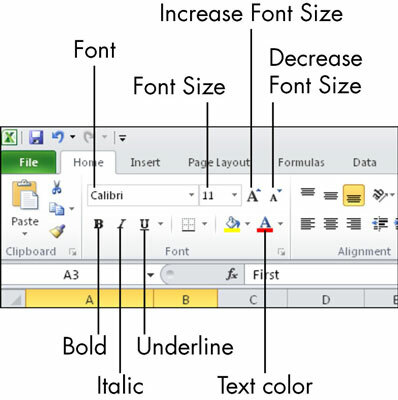 Text formatting within a cell in Microsoft Excel works very much like it does in Word and PowerPoint. You can change the font, font size, color, attributes (such as bold or italic) and more for an Excel spreadsheet cell or range. Select the cell(s). On the Home tab, use the buttons and drop-down lists in the Font group to apply text formatting. Text alignment controls how the text lines up within cells. You can use the controls on the Home tab to work with cell alignment. Cell alignment refers to how the text interacts with the available space in the cell. Orientation refers to the direction of the text. By default, text runs horizontally from left to right. You can change that with the Orientation button on the Home tab. For example, you could use vertical or slanted text so that labels in a heading row take up less space horizontally. To do so, select the cell(s), click the Orientation button, and make a selection from its menu. Horizontal orientation describes whether the text is left-aligned, right-aligned, or centered when the cell is wider than needed to accommodate the entry. 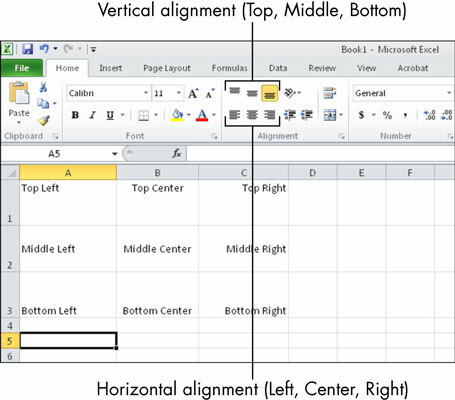 Vertical orientation describes whether the text aligns with the top or bottom of the cell or is centered vertically between the top and bottom, when the cell is taller than needed to accommodate the entry. 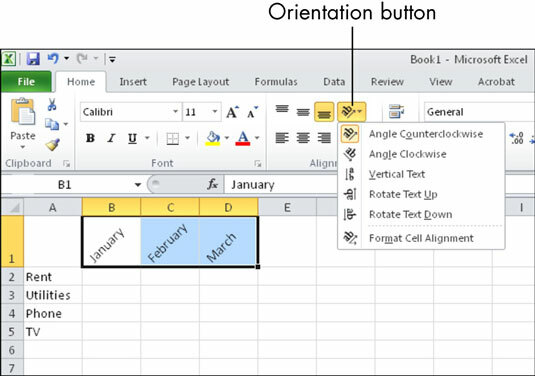 Excel differentiates between angled and rotated text on the Orientation. Angled text is diagonal; rotated text is straight up-and-down.